Mykonos is just one of the many beautiful islands in Greece, so why choose it to be your next holiday destination? Well, what this island lacks in size, it certainly makes up for in spirit, with thousands of tourists flocking to this cosmopolitan destination year after year. It is one of the most visited islands in the Aegean. The best time to take a trip to this enchanting island is May or June as it means you won’t have to deal with the hoards of visitors that arrive in the prime season of July and August and the weather at this time is much more comfortable with less intense heat. Generally, an out of season trip to Mykonos will also be much less expensive, which is of course an added bonus! So why pick Mykonos specifically? Simply put, this little island has an abundance of character that is difficult to emulate elsewhere. You just have to step foot into Cycladic, the extraordinarily picturesque town of Mykonos to see what all the fuss is about. Lines of charismatic whitewashed houses and charming old churches greet you and lead you to the beautiful harbour, where watching the sunset is a must do. Cycladic also embodies an incredible mix of old and new, with the traditional architectural style of the town remaining firmly intact yet the presence of modernity has still very much been welcomed. There are lots of little tourist shops, art galleries and up and coming restaurants and cafes to ensure you are never bored! Sun, sea and sand and a little extra? As well as the cultural richness of this island being a major allure to tourists, clearly the turquoise sky and sea, the endless stretches of golden beaches and the beautifully unique whitewashed buildings don’t go unnoticed amongst visitors. Is Mykonos beginning to sound like the perfect getaway? So now all that is left to do is to choose the type of holiday you would prefer. If it’s a relaxing break with your family or partner, the north of the island could be the ideal location. With its secluded beaches and laidback atmosphere, there is simply nothing to dislike. However, if you’re after a bit of adventure and action, fear not as the south of the island has all you could want and more! Skiing, horseback riding, windsurfing, jet skiing…the list is just endless. It would be impossible to find an activity you couldn’t do here. Or if you’re a bit of a party animal and want to dance the night away with your friends, the crowds generally flock to the south. The nightlife in Mykonos is world famous, so why not come and try it out? See what you would rate it! And if you’re still not convinced Mykonos is the place for you, it’s a tremendously popular destination amongst the rich and famous and the brilliant cosmopolitan style of life reflects this. The celebs can’t all be wrong can they? 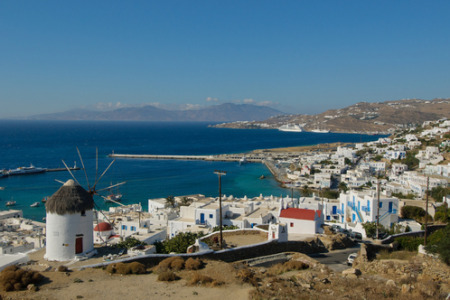 And picking Mykonos as your next holiday means you won’t miss out on ‘Little Venice’; home to the renowned windmills that gently turn in the breeze and overlook hundreds of brightly coloured Venetian style houses! You must check this place out during your escape to this fabulous island. So, what’s not to love about Mykonos? For a cheap yet fantastic holiday to this island, look no further than our website, which will ensure you book the best deal possible! Want to know more on Mykonos? Read our blog below. Celebrity Holidays: Visit the Resorts from Reality TV - Follow in the sunkissed footsteps of your favourite reality stars this summer.